Rather than continue wearing the cheaper (and potentially harmful without UVA protection) sunnies I picked out a pair of Ray-Bans. They're a brand men will already know and trust, so they'll understand they're special. This pair are a classic rather than a brand fad so will get the seal of approval more easily. Worth noting that Mr P seems to stock all the frames that have sold out on the women's sites too, so do check them out if you're hunting for yourself. Shop Ray-Ban here. My Dad has always been keen on a pair of Vilebrequin shorts but has never got round to buying them and instead lives in high street pairs that last one summer. This year we thought we'd give him an upgrade. He's off to Spain and Portugal for a big birthday so we couldn't have him not looking smart. We picked out these ones although it was a tough call. The rest of the brand's selection is here. Now in truth this is as much for Mum and I as it is Dad and Gus. If you're Dad and partner are anything is like mine they'll always complain over the price of a candle... However, sit them down in a room where a decent one is burning and you'll see the shoulder go down and you may even get a "this is nice." I have a few favourites but the brand that seems to last the most (and stretch the furthest) is Diptyque. Their hero scent is the Baies which I really suggest, but also love the Figeurs which is arguably more masculine. As a pure treat, a quality shirt not meant for the office is a brilliant gift as it's so often an after thought in a man's wardrobe. The boys in my world know what they like, and most of it stems from designers they've worn for a long time, or aspired to. You can't go wrong with a Ralph Lauren shirt, like this one Lopez has cleverly picked out for Gus. Mr P have loads of options with some great up-and-coming names too - if you have the kind of guy who likes to be the first to find the next new thing... Shop shirting here. I'm not sure about you but the boys in my life are much more partial to a good beauty product having tried and tested quite a few of my own on the sly... I thought I'd use Fathers Day as a way to save my own products (!!) so I've picked out some bits I know will go down well. Tom Ford is the King of men's grooming and his scents are the best in the market. Whilst the scents are a little pricey you can get items in the range for much, much less. This body oil is a good start and smells divine. Equally the concealer (men do use it; let them know its there and watch it gradually get used up) and the anti fatigue eye treatment (so good I sometimes steal it). Or, if you're guy is a tech-fiend try at Foreo. Being honest with you, I've stolen the electric toothbrush that arrived and am now saving for a second one. If you're one of those people who loves a good bathroom set up (it's ok, there's lots of us) then a normal toothbrush just won't do. You need a designer for your dents. This one is amazing and leaves my teeth feeling like they've been to the spa. Ooh and their cleansing system (see picture) is great fora bearded man who wants to make sure his pores get a good clean, here. In general, Mr Porter has some of the best grooming brands in the market (hello Perricone MD and Malin and Goetz) edited with real expertise. If you're trying to get a guy into the concept their Grooming Box is brilliant, here. All men like a good glass. Well at least all the men I know. I don't understand it but there seems to be something very pleasing about pouring yourself a drink into a well cut piece of crystal. 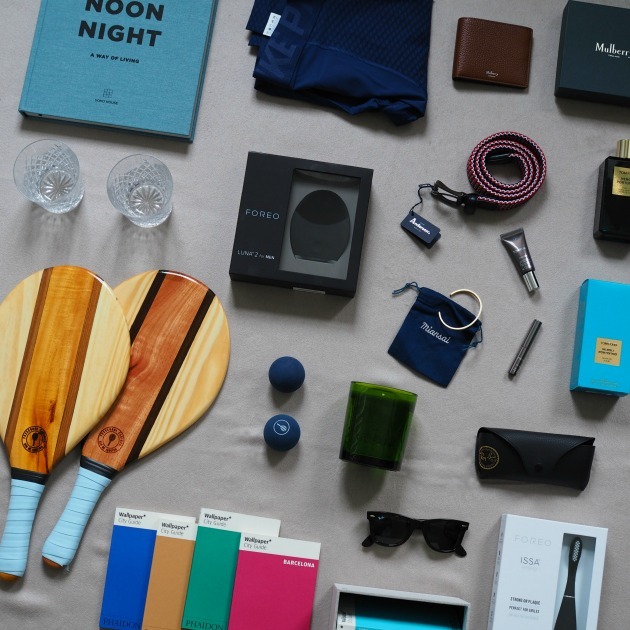 Unless you've been living under a rock you'll know the people behind the Instagram fuel members club have set up Soho Home which offers a selection of the products used in their houses. It's all really, really lovely but the glasses are one of my favourite bits, here. As you know, I've ramped up my fitness and we're both really making an effort to get outside together. I've definitely noticed that us girls are better at running outfits than boys so thought I'd spoil Gus with a proper pair of running leggings from Nike. I'd never have thought of Mr Porter for these so am really glad I discovered their Sportswear selection. These running leggings were recommend by a trainer and seem to have gone down very, very well. ooh and perhaps a nice belt so he'll stop wearing his work ones on weekends? This one is great. Other fun ideas include a bat and ball from Frescobol Carioca and good bathroom reads like Phaidon's Wallpaper travel series, here. You never know, your gift might inspire a trip! Ooh actually it's worth nothing that Mr P's selection of books is really good for any gifts (not just the boys). This selection will make any one on the quest for the perfect coffee table selection weep. 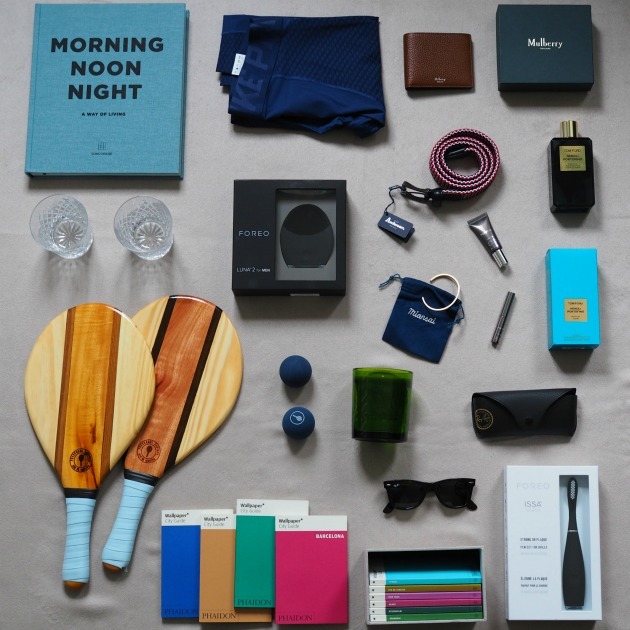 They also stock the "must have" Morning, Noon, Night from the guys at Soho Home - if you're ever in need of a gift be it a birthday or a housewarming this always goes down well. Continuing with the theme, men are susceptible to a bit of pampering. If my grooming suggestions weren't enough then I strongly recommend the brand's dressing gown. It's absolutely enormous and like wearing a cuddle. 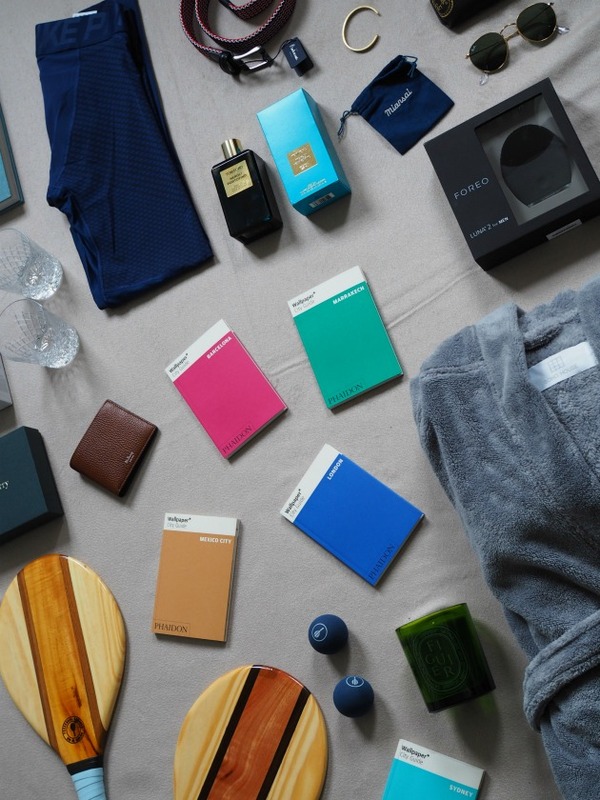 I hope that helps you lot choose out some gifts, was so impressed with the Mr Porter offering! Whatever you're doing this coming Sunday I hope you have a brilliant one! This post was in collaboration with Mr Porter. Photos were taken using the Olympus PL-7 here using the 25mm lens (a new purchase I'm delighted with) here.